Innogy owns a US company, Georgia Biomass , which according to its website, is the largest wood pellet plant in the world. It has an annual production capacity of 750,000 tonnes and produces pellets mainly for European power stations. The US environmental organization Dogwood Alliance  criticizes Innogy’s biomass operations: “Innogy is directly responsible for forest destruction here in the US. Big biomass facilities in the US South like Georgia Biomass are increasing forest destruction at a time when, more than ever, we need to keep our forests standing in the name of climate change, not log them”, emphasizes campaign director Adam Macon. In cooperation with its international partners Denkhaus Bremen is challenging the industrial-scale burning of wood by German electricity companies. Its biomass campaign is making links between campaigns against logging and pellet mills overseas and the environmental debate in Germany. In April 2016, RWE turned its previously fully-owned subsidiary RWE Innogy into separate and independent company called Innogy. See: https://www.gabiomass.com/ . 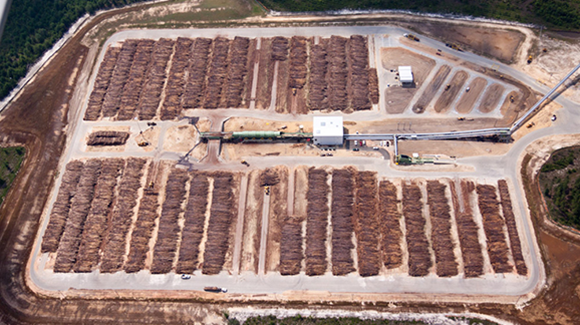 Georgia Biomass operates one of the world’s largest wood pellet plants at Waycross, Georgia. Previous PostNGO letter on FAO: Forests are not fuel. Next PostUnipers wood burning in Provence power station destroys forests!